In addition to this, MS Outlook also provides seamless connectivity even when the connection to Exchange Server gets lost. In order to avoid any critical loss to significant email items, many users and Admins prefer creating the PST data files on their computers. But, creating a PST file doesn't give a ticket for foolproof protection of emails because several hardware or software malfunctions can further corrupt the PST file. Hence, recovery of those corrupted or damaged Outlook PST files is the ultimate concern of any user in this racing time. Promises accurate recovery of damaged PST and its components like attachments, emails, calendars, contacts, appointments, drafts, etc. Restores PST email along with its Meta data like Date, Time, Subject, CC, BCC, To, and From. Incorporates technical expertise to migrate repaired PST emails into Office 365. Stringently works on the password-protected PST files. Embedded with intuitive capability to export PST mailboxes on renowned email servers and web-based email applications. Flawlessly recovers the permanently deleted email messages without losing its properties. Provides latest file saving options such as MHTML, DBX, RTF, HTML, MBOX, MSG, EML, TXT. Works best with all the editions of MS Outlook 97, 98, 2000, 2002, 2003, 2007, 2010, 2013, and 2016. Above mentioned features is just a preview of some essential features as the Kernel for Outlook PST Repair software owns best-in-class features. In order to explore deeply, let us analyze the other aspects of software by viewing some of its important visual interface. 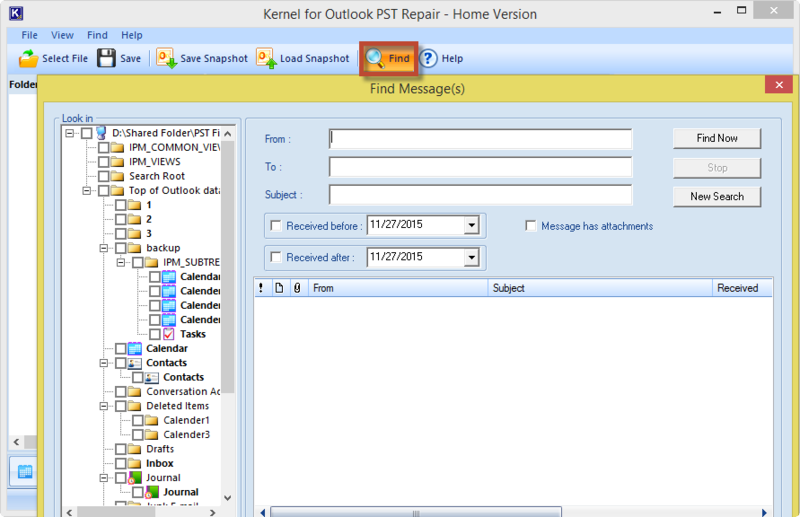 Kernel for Outlook PST Repair has the distinguished approach to repair and save the Outlook PST file. To prove the former point, let's have a look on the software interface. 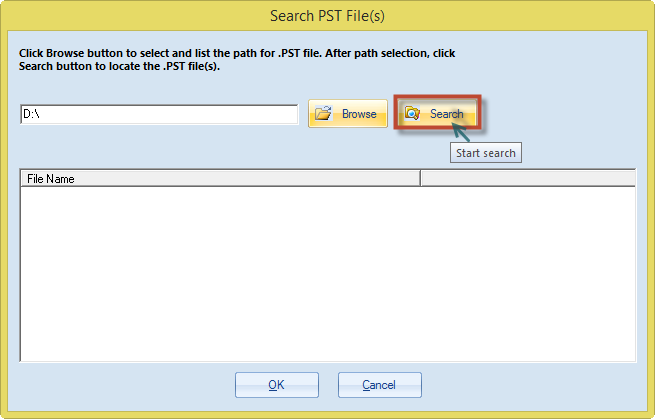 Search Option: If your PST file recovery operation is hindered by misplaced PST files that are difficult to locate, then use the Search functionality, which is provisioned in the Kernel for Outlook PST Repair software. To begin search, just click the Browse button to specify the drive location, and then click Search. This search facility will give you all the available PST files in the specified hard drive location. Refurbished Hierarchical Preview: Kernel for Outlook PST Repair is engineered with lively left panel that renders the simplistic view of retrieved email items in the hierarchical structure formation. With this normalized display, one can easily identify each and every object of PST mailboxes such as Inbox, Journal, Calendar, Sent items, Outbox, etc. Hence, it eases the identification and selection of email items. Intelligent Find Function: One of the intelligent feature of this software is Find functionality, which is primarily embedded to search out the desired email items by configuring several conditions and parameters. To begin search, click the Find button from the menu-bar and specify required input strings and conditions. You can also select Received before and Received after conditions to extract email items falling under the specified date range. This awesome feature lets you to get what you want in minimal amount of time. Save & Load Snapshot Features: During PST file recovery, when you're urgently required for other important tasks, then you need to pause or stop the PST recovery operation in between. However, if you begin the PST recovery process again from the start, then it's the total wastage of time. Keeping this in mind, the software has the provision to save and load the snapshots that acts as the memory for preserving the progress of PST recovery. To save the snapshot, click the Save Snapshot button from the menu-bar, which invokes the Save Snapshot dialog box. Specify the saving location and name of the snapshot and you're done with it. To begin the process from the same instance, click Load Snapshot. 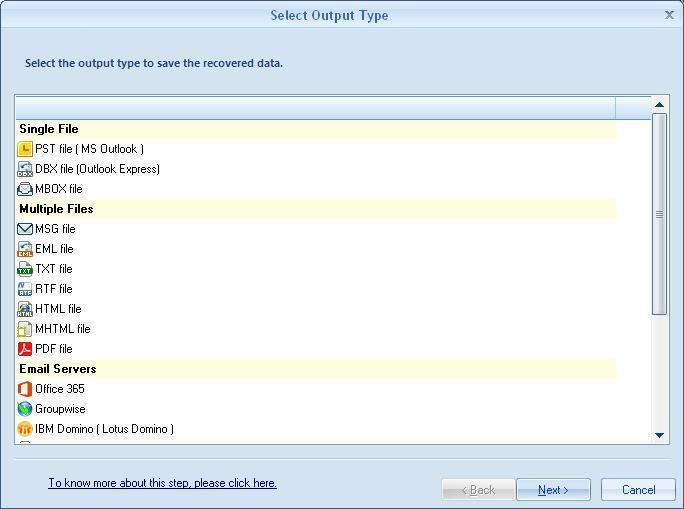 Unlimited Saving Alternatives: Kernel for Outlook PST Repair is the single application that incorporates versatile saving options as you can see in the screenshot. You have the flexibility to save recovered email items in the single file, multiple files, email servers, and web-based email clients. Moreover, the software is featured with Office 365 migration options that lets you to export all emails to the cloud subscribed Office 365 accounts. 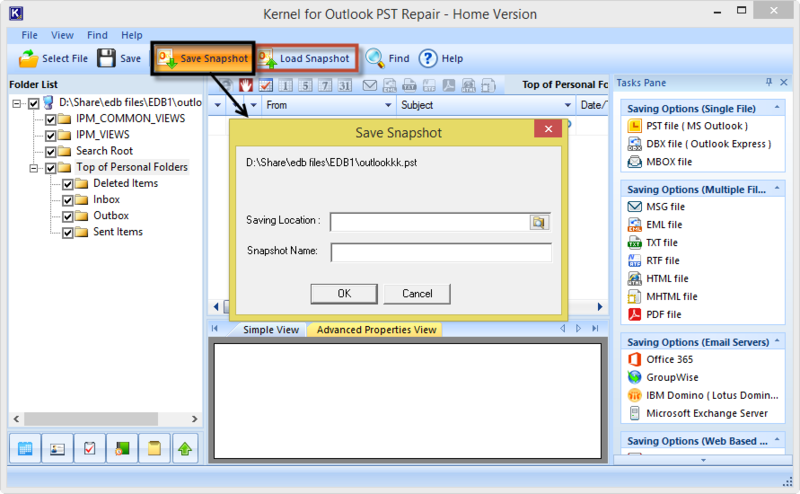 Amazing File Analysis Reports Facility: Kernel for Outlook PST Repair provides you dynamic options to capture several email activities. To use this facility, just navigate to the File Analysis Reports section and click any of the activity you want to check. As you can see in the screenshot, once you select the desired email items and click the Analyze button, the bar-graphical will get rendered on your screen. There is another amazing Outlook PST Repair tool also available to recover your lost PST data without any hassle.